There is nothing greater than a mammoth cricketing series that evolves over the course of several weeks or months, especially if they feature teams at their greatest. Nothing. Not even live versions of Pink Floyd’s Comfortably Numb. The ebbs and flows of a classic series linger in the memory like a sober kiss. The Antipodean summer of 2006/7 was such a series and therefore totally befitting of a retrospective examination. 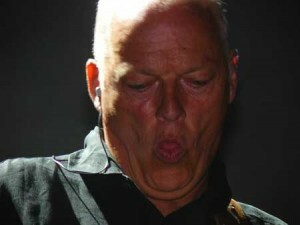 Comfortably Numb was written about the pain and ecstasy of following an overseas tour from your own bedroom. Fact. The return of Michael Vaughan as captain couldn’t help England as Australia chased down their target of 243 in 45.2 overs; an attack featuring Jon Lewis and Jamie Dalrymple didn’t help either. James Franklin showed everybody what he could do by conceding 41 runs from four overs and, batting at 9, scoring six from 13 balls. Not even 84 from Ross Taylor could prevent New Zealand being bowled out in the 39th over. Four wickets from James Anderson restricted New Zealand to 205/9 from their 50 overs. Andrew Flintoff (72*) top scored in England’s chase and got them over the line with a ball to spare, despite the best efforts of Dalrymple (one run from five balls) and Lewis (two from six). Jamie Dalrymple: the Syd Barrett of spin bowling. In came Mal Loye for Vaughan and for a while it looked like the debutant was a splendid selection as he scored 36 at a run every ball. Glenn McGrath and Nathan Bracken slowed the scoring rate however and England limped to 155ao. Tight bowling from Anderson and four wickets for Lewis slowed Australia’s passage to victory, but they still won with more than 11 overs in hand. Craig McMillan’s 89 formed the cornerstone of his team’s 218ao; this time it was Stuart Clark who bagged four wickets. Michael Clarke (75) and Mike Hussey (65*) oversaw the chase but somehow Australia managed not to hand out a thrashing – for which Cameron “five runs from 15 balls” White deserves some credit. 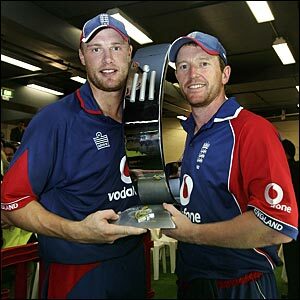 In one of the great ODIs, New Zealand scored their 210ao from precisely 50 overs; Jacob Oram top scored with 86 whilst Flintoff took 4/21 from 10 overs. For England, only Andrew Strauss, Ed Joyce (47) and Paul Collingwood made double figures, whilst Dalrymple contributed a six-ball duck. Dan Vettori returned 4/24 whilst even James Franklin took three wickets (the top three, no less). At the half-way mark, Australia had beaten each side twice whilst England and the Kiwis had lost to each other once. This time, England scored even fewer runs, being bowled out by Mitchell Johnson and friends for 110. The last five wickets fell for seven runs, four of which were scored by Nixon. In reply, Australia enjoyed the new-look England opening bowling partnership of Liam Plunkett and Chris Tremlett. They won with more than half their overs still to bat – and the only wicket to fall was a run out (executed by the sublime Plunkett, natch). 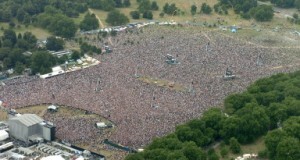 The crowd gathering for Liam Plunkett’s homecoming was slightly larger than anticipated. Finally this series of Nile proportions burst its banks, flooding the run-desert with, erm, floods of runs. Matt “Matty” Hayden and Rick “Ricky” Ponting both scored hundreds (and put on 200 together for the second wicket), followed by 50 runs coming off the final four overs. 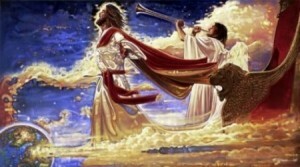 Amazingly, their 343 was not completely beyond New Zealand, who were aided by Johnson leaking 48 runs from six overs. Needing 25 to win from the final over, they fell just short, but Oram did bring up his 100 with three balls to go. We’ll gloss over Franklin scoring his 13 runs from just five balls and point out that even Peter Fulton managed to score 60 on this pitch against this attack (Brett Lee conceded 71 from 10 overs; Shaun Tait 26 from the same: what kind of Goddamn malfunction in the space-time continuum occurred that day we’ll never know). Anyway, normality resumed with Ponting making 104 and Brad Hodge 99* (he scored the two runs needed for victory, so we shouldn’t blame his partner White for stranding him, but we will anyway). And there it was: history, or something akin to it anyway. A century from Collingwood set up the victory and Plunkett’s 3/60 secured it – despite Fleming’s 106. England qualified for the finals and New Zealand were sent on their way. From the relative comfort of 170/1 at 30 overs, Australia collapsed to 252ao from less than 49. The wickets were shared around (although Plunkett missed out), with Hayden being recorded in the score book as being dismissed by the holiest of pairings c Mahmood b Dalrymple. England’s chase began badly, with the first three wickets falling for 15 runs. But Bell scored 65 and Collingwood a marvellous 120* – although the bums were dripping somewhat when, needing 32 from 30 balls, Flintoff (35) and then Dalrymple (3) were dismissed. In the end, Collingwood hit the winning run from the third ball of the final over. In a rain-affected match, England were too good, too great, for Australia. 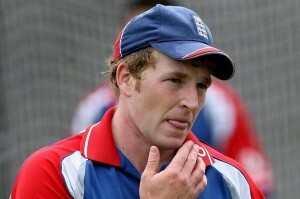 Again it was Collingwood who top-scored (with 70) as England made 246/8 from 50 overs. In the second innings rain fell with Australia 39/2 from six, the boffins set the home side 187 to win from 27 overs. On the return to the middle, Plunkett grabbed the ball and did what he does best – bowling Gilchrist with his first ball and having Clarke caught behind from the sixth. The wickets continued to fall and Australia were well short by the time the umpires decided to give them their lethal injection. Great things were still afoot. Oddly, the famous urn wasn’t presented to Flintoff, but the Ashes – or something very similar and of at least equal stature – were in the bag. At the time it seemed odd that the Powers That Be replaced the traditional five Test matches with a limited overs tournament, but by jingo it was a fantastic decision. The replacement for the little urn was frowned upon by traditionalists but welcomed by the more open-minded cricket fans.